The Friend of the Children comes out of the wood"
In many ways, Val Lewton’s follow-up to the landmark Cat People is proof that old Hollywood wasn’t much different from current Hollywood. 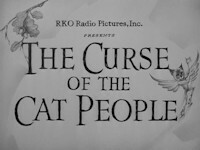 1944’s The Curse of the Cat People was never even meant to be a direct sequel to his previous film, even if it did carry over some of its characters. Lewton had crafted a quiet little fairy tale and titled it Amy and Her Friend until RKO got their mitts on it. They not only changed the title to hark back to their earlier hit, but also insisted on some re-shoots to accommodate the change (for example, the film’s lone reference to an actual cat was an insert) . 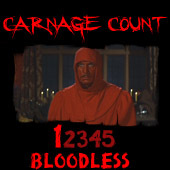 The company also insisted on a marketing campaign that highlighted the film’s sparse horror elements, which befuddled both contemporary audiences and viewers throughout the years expecting more of the same. Picking up some years after Cat People, the sequel finds Oliver Reed (Kent Smith) happily married to former co-worker Alice (Jane Randolph). The two have a six year old daughter named Amy, who is rather distant and aloof compared to her peers. Constantly daydreaming and living off in her fantasy own world, she’s alienated from other children and her parents. One day, she stumbles upon the old house in the neighborhood that every kid avoids; inside is Julia Farren (Julia Deen), an old actress who lives with her estranged daughter (Elizabeth Russell). Her parents are alarmed by this development, and things only get weirder when Amy claims to have a new imaginary friend named Irena, Oliver’s first wife who has now returned as a ghost. The Curse of the Cat People isn’t so much a horror film as it is a ghastly Christmas fable. While one would hardly call it a typical Christmas movie, it does climax on the holiday with themes of forgiveness and acceptance. It is perhaps a bit too disjointed for its own good (perhaps due to all of the studio meddling), but the thrust of the narrative captures the somber loneliness of childhood. Amy is an eerily detached child, and I think her relationship with Irena is an interesting one that speaks to the ingenuity of this follow-up, as there’s the subtle hint that Amy is the child Irena was never allowed due to her untimely demise. Just as no one believed Irena about her curse, no one believes Amy, so the two are kindred spirits of sorts. This is also a natural extension of the original film and gives Oliver a chance at redemption, whether he deserves it or not. He’s rightfully haunted by his past and regretful of his first wife’s fate, which is he is forced to revisit through his child. And it would have been easy for this film to be one of karmic retribution and revenge following Oliver’s tortured life. That’d be the natural route, but Lewton had no interest in photocopying the same film, which is commendable. His clash with RKO eerily foreshadows the battles that auteurs would have with studio men for decades to come (not that Lewton was the first to endure this). Certainly one of the more creative sequels of all time, The Curse of the Cat People could indeed be completely divorced from its predecessor; in fact, you barely even need to have seen Cat People to understand it. This is for the better anyway, as Amy is much more interesting than Oliver, who doesn’t carry over a lot of currency given his treatment of Irena in the first film. His daughter’s story feels like the projected childhood of a solitary dreamer not unlike Lewton himself, who apparently injected elements from his own life into the story. Amy stuffing letters into a hole in a tree is one such element, which weirdly anticipates To Kill A Mockingbird, a novel that wouldn’t be published until 16 years later. Still, I think that’s a decent comparison from a bildiungsroman perspective--Amy is the curious, isolated child who has a lot to learn from grown-ups, and a lot of teach as well. Toss in a dash of Henry James’s “Turn of the Screw” to account for the film’s gothic overtures, and you’ve got a decent portrait of Curse of the Cat People. Of note behind the camera is debuting co-director Robert Wise (RKO gave him the gig when von Fritsch went over budget), who would go on to helm several landmark films in a career that took him from the mean streets of West Side Story to the final frontier of Star Trek. Here, he and Gunther von Fritsch construct a an elegant and glossy production that mask the film’s shoestring budget (penny pinching was Lewton’s hallmark and arguably paved the way for the likes of Roger Corman). The dazzling, shadowy camerawork broods with expressionistic power, and the film visually mixes fairy tale backdrops (such as snow-covered landscapes) with typical horror trappings (such as Julia’s old dark house). If Curse of the Cat People ever feels like a horror movie, it doesn’t come until the end (not unlike the original film), when Amy flees her home and eventually finds herself in peril at the hands of Julia’s bizarre daughter. Even that moment gives way to fable-like moralizing; the subplot involving Deen and Russell is quite interesting, even if it does feel a bit tacked onto the narrative. Its importance isn’t revealed until that climactic moment, though one can see an obvious parallel between the two estranged daughters of the story. The disjointedness keeps Curse of the Cat People from being completely masterful, but it’s difficult to deny its intrigue, if only because Lewton dared to be different. Most importantly, he succeeded by delivering a rich ghost story that arguably exhibits more ingenuity than the original film. The two make for a fine double feature, and Warner Brothers has made it convenient for DVD owners, as they’ve stuck the two together on one disc. Presentation wise, Curse fares quite well, as the 4x3 transfer is pristine, while the mono soundtrack is solid. Both the film’s trailer and a commentary by historian Greg Mank accompany the main features. If you pick this release up as part of the Val Lewton Collection, you’ll also get the Shadows in the Dark documentary as a further supplement. You’ll want to do that, and treat yourself to both the original Cat People and this, the bizarre, misunderstood follow-up that’s among one of the more beautiful childhood horror films ever. Buy it!